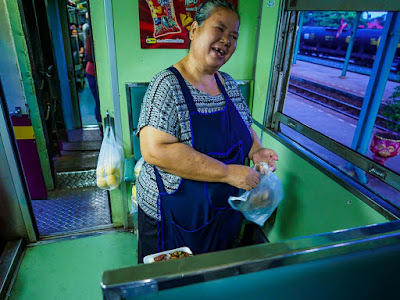 A commuter on the first Chachoengsao - Bangkok train of the day catches up on the news. I went back out to Chachoengsao to photograph morning commuters who take the daily trains into Bangkok. Chachoengsao is a pleasant provincial town about 75 kilometers (45 miles) from Bangkok. The fact that it takes at least 90 minutes to drive to Chachoengsao is a testament to how traffic there is between the two towns. The trains, when they run on time, take a little over an hour for the same trip, making the train a much quicker option. A lot of Bangkok workers live in provincial towns like Chachoengsao, where rents and property prices are much lower, and commute into Bangkok. 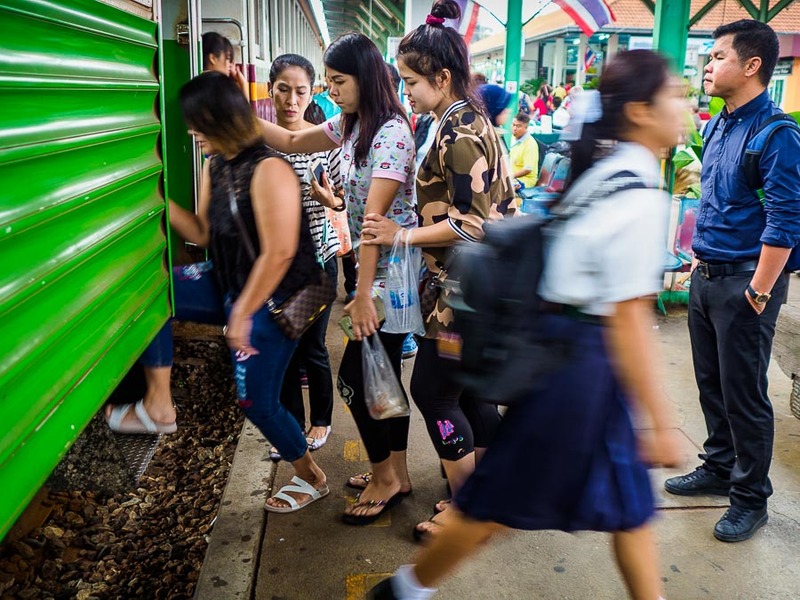 A student gets off a Prachinburi - Bangkok train while commuters line up to get on the train. Prachinburi is the largest town past Chachoengsao. 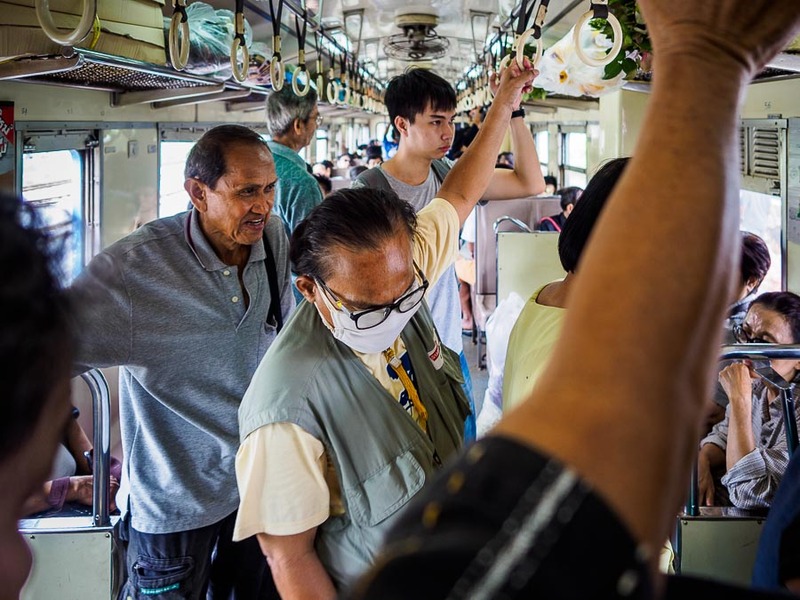 The train, a local line that stops at most of the communities between the two towns, brings many students into Chachoengsao. To their credit, Thai authorities recognize the problem and are trying to make deals with rail companies in Japan and China to help maintain and improve Thai trains, especially the implementation of high speed rail. Waiting for a morning commuter train to leave Chachoengsao. The relatively short train ride means a worker can catch a 7.30 train and be in the heart of Bangkok by 8.30 - 8.45, in plenty of time to get to work by 9.00. Assuming everything is on time. 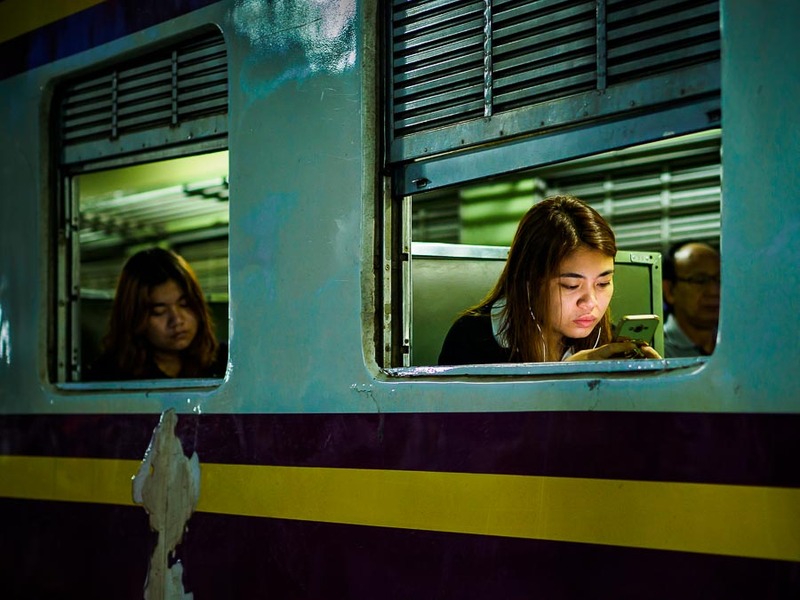 I like photographing on Thai trains, especially the third class trains. It gives you a chance to meet interesting people and see parts of the countryside. Living in Bangkok, it's easy to forget how really lush the Thai countryside is, especially during the wet season. We've had so much rain this year, the fields are practically glowing green. On my ride back to Bangkok, I shared a seat with Thai man who started our conversation by saying "How about that Donald Trump. What do you think?" I laughed and switched the conversation to the weather. The commuter trains are frequently standing room only. I went out to Chachoengsao expecting the morning commuter trains to be jammed. That turned out to not be the case. The morning trains to Bangkok were not standing room only. Interestingly, the afternoon trains from Bangkok to Chachoengsao were jammed - so crowded I couldn't walk through the train to photograph. On the first train of the day, a vendor packages meals for her customers. The train pulled out of the station just after sunrise. 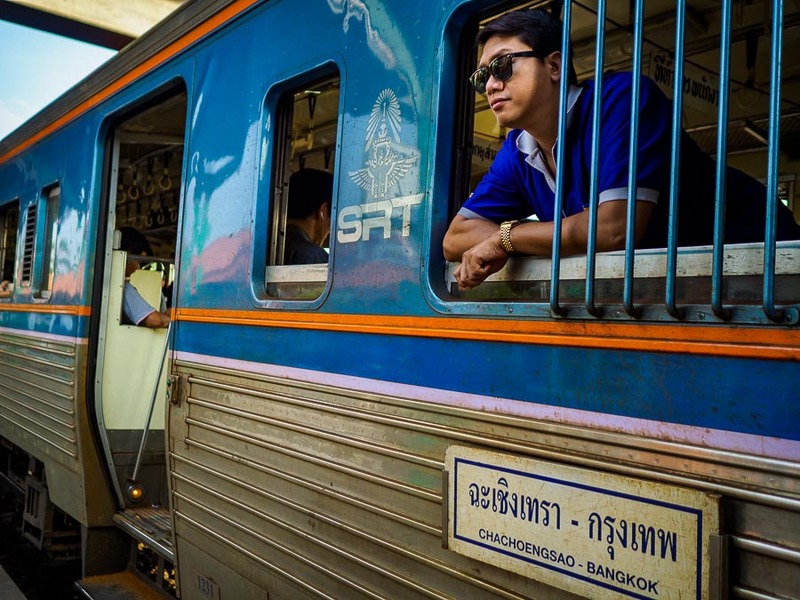 There are more photos of the Thailand's trains in my archive.